In June 1967, David Rubinger, a press photographer in Israel, followed IDF forces that were fighting to liberate the Old City of Jerusalem. 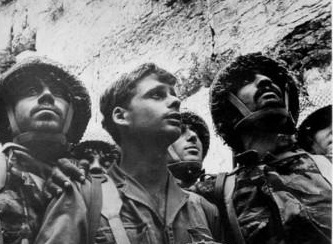 At the Western Wall, three IDF soldiers posed for a photograph. They were Zion Karasanti, Yitzhak Yifat and Haim Oshri. While their names are not famous, their faces have become a symbol of the reunification of Jerusalem. From his Jerusalem electronics shop, this 15th-generation Jewish Jerusalemite sage shares his views on Israel's situation - and her value to the west in keeping global jihad in check.